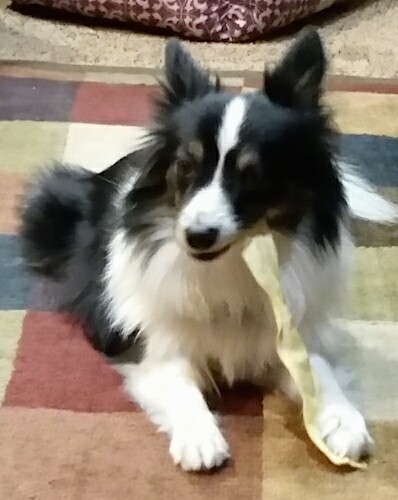 Mr. Chu the Papillon / Shetland Sheepdog mix breed at 2 years old—"We adopted Mr. Chu when he was 4 months old. He joined our Australian Shepherd, Brickle, that was 1 1/2 years old. Mr. Chu is like a kitty that barks! He is very playful and even demands that we or Brickle join in his game. Mr. Chu LOVES freeze-dried liver treats and asks for them (a "pig" cookie jar) by squaring up and giving a demanding bark. Watching him enjoy his rawhide is very entertaining; he runs off with it, tosses it, scampers and tips his head as he barks at it! Those big ears funnel in every sound! He barks at the trash collector, street sweeper and any courier with gusto! He stretches, yawns and stacks paws left over right - so cute! He is allowed to sleep on the bed with me. Mr. Chu is extremely jealous and will start a fight with Brickle over our attention or a toy. Bad habits include pooping just anywhere in the backyard and barking all the way home from the groomer because he wants to get amorous with Brickle. Mr. Chu would probably be easier to train if he were our only dog, but he puts himself in a "contest" with Brickle over everything! My husband has trained him to sit, back-up, stay and wait." The Shelillon is not a purebred dog. 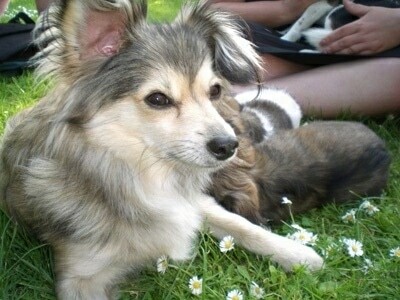 It is a cross between the Papillon and the Sheltie. The best way to determine the temperament of a mixed breed is to look up all breeds in the cross and know you can get any combination of any of the characteristics found in either breed. Not all of these designer hybrid dogs being bred are 50% purebred to 50% purebred. It is very common for breeders to breed multi-generation crosses.